In case you want to protect a directory from public access, you can add Apache basic auth to it. 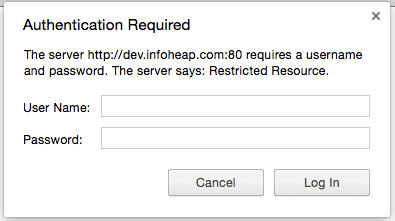 This may be needed if you have a wordpress or some other software and want to keep some internal scripts behind auth. Here are quick steps to do this using Apache or .htaccess configuration. Use the following code if you want to add basic auth to a location /internal which is served by directory internal inside Apache document root. Use the following code in .htaccess in directory internal. When the above location is visited in browser, here is how the basic auth is asked by browser. Any user and password mentioned in /etc/auth-file can be used for authentication. Here is the video tutorial on same topic (courtesy Webucator – Online and onsite instructor led training classes). You may also want to checkout their Apache courses.